A powerful concentrated window and glass cleaner designed for streak free cleaning. Contains modern volatile detergents, emulsifiers, solvent, and corrosion inhibitors making it ideal for glass and almost any hard glossy surface. 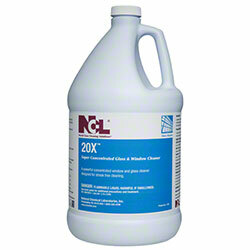 Can be diluted with up to 20 parts of water, quickly dissolves soils from glass to leave a film and streak free surface. Safe to use and non flammable at use dilution.